"Goldwidows" are the women whose husbands work in South Africa's mines - often without returning home for five years at a time. 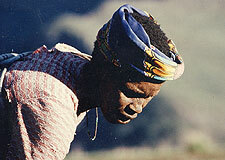 GOLDWIDOWS focuses on four Basotho women of Lesotho. Although most Basotho men, and sometimes 60% at once, have worked in South Africa's gold mines, apartheid laws forbid these women and their children from entering South Africa. They are forced to live as practical widows. Each tells of her life, coping alone, caught in the inhumane web of South Africa's oppressive system. In South Africa's President Steyn Gold Mine, 8000 men live in a compound next to the mine shaft in which they dig, far from their families.